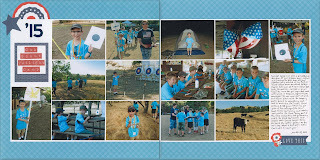 Another Cub Scout layout into the album! This is from Twilight Camp back in June. As usual, I took a ton of photos, so it was a challenge to winnow them down. I tried to choose photos to represent the variety of activities Trevor and the other boys did. 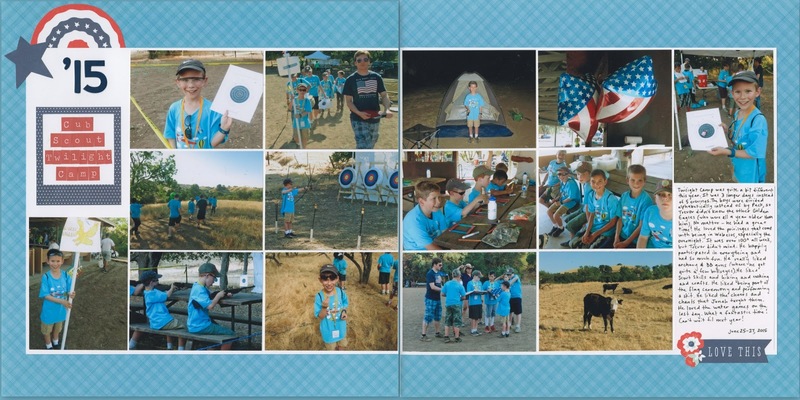 Choosing a color scheme was easy, as the camp theme of "Take Flight!" used patriotic colors. It's a nice change from the earth tones I often use for Cub Scout pages. Loveeeeeeee this! LOVING the photos and the colors!!!!!!!!!!!!!!!!!!!!! You are so good at the multi photo layouts! Everything always looks so neat and cohesive and I love that you always find room for journaling!